We have all heard the saying,‘it takes a village to raise a child’. Unfortunately, Westernized culture falls short in that regard. There is no longer a village to help you figure things out when your baby arrives, to take care of not only baby, but also of mom (and the other parental units). In our Western society, you have a baby and are quickly sent home to figure it out on your own! Little wonder that mothers arrive home physically exhausted, emotionally depleted, many with limited (or no) experience with babies or children, and they find themselves easily anxious and confused about ‘doing what is right’. “Our alarmingly high rate of postpartum blues in this country (50-85%) occurs, in part from the mode of thinking that says ‘do it yourself and learn instantly, without experience, with little training, and with little or no guidance, perhaps the most essential role you will ever perform” (Heller, S. 1997, pg 25). Some cultures, including those throughout South America, Europe (Greece), the Middle East and Asia, have a 20-60 day rest period, which is considered mandatory after an infant’s birth. In this time the mother is not expected to leave the house, cook food, or do anything. The family members and ‘village’ take care of all the day to day tasks so that mom can rest and fully heal from the trauma of birth and bond with her baby (Eberhard-Gran, et al 2010). The village, and the support that comes with this village is so crucial to the wellbeing of moms and babies. In our Western society, we need to re-build this concept of the village. Because this village is not easily available, we as parents often seek out baby classes and activities to build our network, to find the support, to figure out how to take care of our baby and help them develop into independent and successful people. We know that 80-90% of brain development happens in the ‘early years’ (0-5 years), with the first year of life being of utmost importance to the making of neuronal connections in the brain (Think Small Blog, 2017). We know that optimal development of social, emotional, and cognitive areas occurs through attachment and feelings of comfort and security with a primary caregiver (Insel and Young, 2001; Sroufe et al, 2005). Research is also showing that emotions are transmitted from one person to another and that infants embody stress from their mother’s stressful experiences (Bunim, J. 2014). How do we provide this feeling of comfort and security? We support moms, who then support their babies! 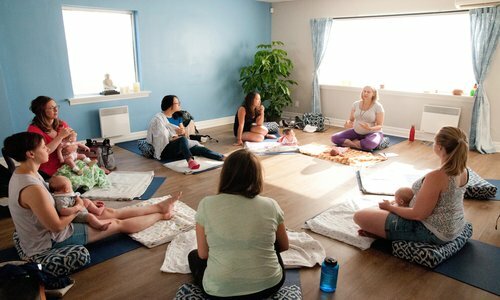 I designed a mom/baby group program focused on infant development, which integrates various courses I have taken and collaborations with other professionals, such as dance/movement therapists, yoga instructors, and infant mental health therapists. The program supports an unmet need in the community and lives of new moms through participation in a group setting, while still receiving individualized support as needed. Education is provided on concepts such as: how to encourage appropriate developmental movement patterns; how to engage in (and enjoy) tummy time; supporting better sleep and digestion; stimulating sensory motor systems for optimal development; deepening bonding and attachment between mom and baby; learning engaging activities and games to play with baby as they grow (and why we actually don't need all the baby toys! ); assisting in nervous system regulation, and supporting moms emotionally so that they can support their children. My goal is to become a part of their 'village', to foster their support network, which will positively impact the health and well-being of both mom and baby. In the future, I hope to branch out further into pre-natal/post-natal women's health, which is an area of Occupational Therapy that is currently in its infancy, so that I can really support moms in all stages of this precious time with their babies. I envision my practice growing through exploring the virtual world of telehealth; working with various non-therapy healthcare practitioners such as sleep and lactation consultants; and offering workshops/seminars on topics surrounding infant development and attachment/regulation principles. I love being a mom and nurturing play with my son, as well as with my clients. I believe the best way to learn is through guided play, laughter, and having fun in a supportive and positive environment. I am looking forward to following my passions, starting and growing my new business, and being a part of the movement to bring back ‘the village' for new moms. Eberhard-Gran, Malin, Garthus-Niegel, S, Garthus-Niegel, K, Esklid, A. Postnatal care: a cross-cultural and historical perspective. Arch Womens Mental Health (August 3, 2010). Insel TR, Young LJ (2001). The neurobiology of attachment. Nat Rev Neurosci 2: 129–136. Think Small Blog. Minnesota’s Leader in Early Learning. Brain Development in Infants and Toddlers. January 2017. http://www.thinksmallblog.org. Newer PostHelp! My Child Won't Sleep!